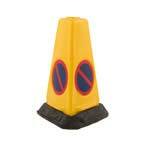 Manage and control traffic in private areas with coloured cones. Reflective temporary barrier system for roadworks / construction applications. 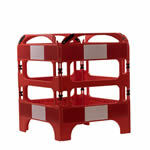 Our durable and high visibility traffic cones, safety cones and road cones come in a range of simple but clever designs. Lightweight cones are easy to stack and store, and provide instant demarcations, temporary partitions and space reservations. 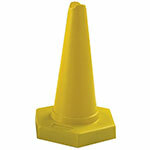 A little heavier are our 2 piece cones, these are kept in stock in our warehouse for fast delivery..
For preventing parking in unwanted spaces the bright yellow Mark 4 ‘No Waiting’ Cones have a triangular base and is similar to those used throughout the UK for traffic control by the police. 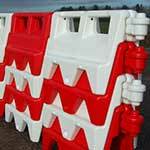 Should you require more than just a few cones then our pallets of cones represent the best value. 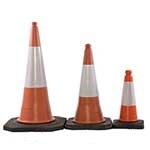 There are a range of sizes of road cone available with hazard cones as small as 45cm high to a large traffic cone that are up to 1m high. If you need road barriers in order to separate traffic from pedestrians or prevent cars getting too close to road work, our Avalon construction barriers are Chapter 8 compliant, for use with traffic. 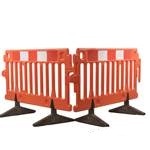 For extra stability, we also offer a range of water filled barriers, these have the advantage of not needing feet to stay upright. 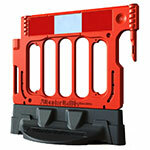 This in turn means that the trip hazards associated with barrier feet are eliminated. 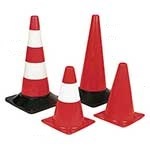 When designing a traffic management system, it is always best to go for the highest quality of cones and barriers. Cheaper alternatives will lack the weight to stand up again the whether and air flow caused by fast moving cars. 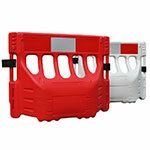 You will find our range of safety barriers will provide a cost effective solution to the management of traffic. 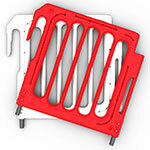 Many of our cones are available for next day delivery, great if you have a project starting soon. The reflective sleeve on these products make them visible both on roads and within car parks. 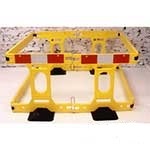 For altering pedestrians to traffic or road works we offer a wide range of options. 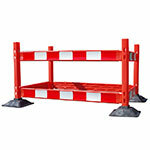 Manhole barrier sets can be erected into a square to completely surround a dangerous hole.